According to a report by AAMC, the number of women enrolling in medical school in 2016 increased 6.2% over the previous year to 10,474. This is the largest increase since 2006. 2016 also represented an all-time high in the overall number of medical school applications, with 53,042 students applying, 38,782 of whom were first-time applicants. Additionally, the total number of US medical school enrollees was more than 20,000 (21,030, to be exact) for the fourth year in a row. This represents a 27.5% increase since 2002. The number of women applying for the first time increased by 5.3% over 2015 (to 19,682). Medical school enrollment in 2016 was evenly divided between women (49.8%) and men (50.2%). • According to a comprehensive study by AAMC earlier this year there will be a shortage of between 61,700 and 94,700 doctors by 2025. Twenty-two new medical schools have opened in the past 20 years to help alleviate this problem. • Despite medical schools doing their part to tackle the looming shortage, there has been a nearly 20-year cap on federal support for physician training. This cap was supposed to be only temporary. Legislation has been introduced to increase federal support for residency training so patients will be able to get care when they need it. • More than 2,000 Hispanic, Latino, or those of Spanish origins enrolled in medical school in 2016, with the number of black and African-American enrollees exceeded 1,700. • 76% percent of medical school enrollees had research experience, with the same percentage reporting having volunteer community service experience in a medical or clinical setting. • The average undergrad GPA for 2016 applicants stayed at 3.55, with the median MCAT score being 502 for those who only took the new exam. This year most medical schools accepted scores from both the old and new MCATs, and advised applicants to take the exam that they were best prepared for and to test when they were ready. • More than one-third of US medical schools are using a holistic approach to accepting students to their programs. They are considering not only grades and test scores, but also the applicant’s personal traits, experiences and qualities. This continued growth and diversity of medical school attendees certainly bodes well for healthcare in the US. It will serve to make a future workforce that mirrors our diverse population and is better suited to meet the needs of their patients. One stat the report didn’t discuss: 21,030 new med students were accepted to U.S. medical schools out of 53,042 applications. (The report doesn’t specify, but I assume it is referencing those applicants using the AMCAS system.) 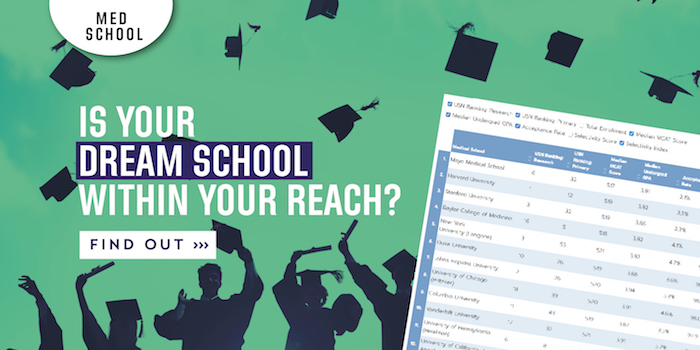 Those numbers imply that the overall acceptance rate to medical school is 39.6% and the overall rejection rate is 60.4%.